It is still red and cream Frederic . Until today I thought it was my camera that gave peculiar colors. I tried today to take some photos again and after some trial and error found out what the fault was. I had used a desk lamp together with the overhead lights to get more light for the photos. It was this lamp which gave the peculiar colors. The photos below I have taken without the desk lamp and is much better. The light color still is a little to yellow but the oxide red looks ok. In my work area I have cheap 2700K fluorescent lights which probably enhance the yellow in the light color. Today I have assembled and mounted the overhang and started on the roof. 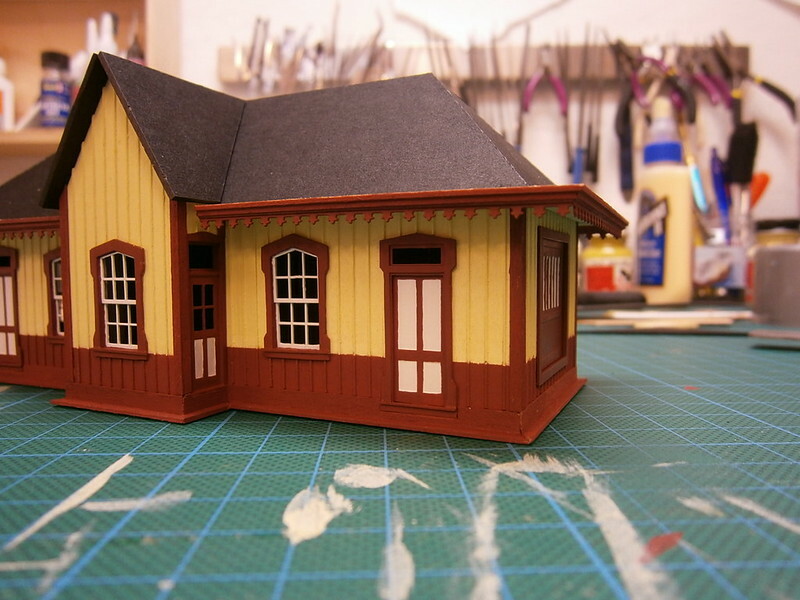 For the roof I'll use shingles from Wild West models. The Station is really looking good H�kan. Your camera may have "onboard" white point/color correction. If not, you can correct this on your computer. For on-camera color correction, put a white card down where the station is, and follow the instructions to have the camera remember the color point. 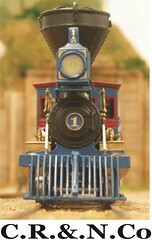 For off-camera correction, put a white card in front of the station. Then you can put the 'set white point' marker on that card and apply the color correction. For what it's worth, I really like the color scheme in the above photos. H�kan,your station is really looking grand! I love the decorative trim hanging down from the eaves. The only thing that stands out to me ,is the gable over the bay windows. Looks kinda bare up there,I went back to look at your original photo to see how they treated this area. And it looks like they had an attic vent in that space, what are your plans? Thanks Bob, Dave and Greg! Thanks Dave, I'll try that out although I'm not sure my camera has that function. Greg, It looks very bare now but the plan is to put the vent/hatch there together with the depot sign and a rotary order board. Not sure how this attic vent works? To me it just looks like a hatch with a hint of something on its right (hinges?). That is looking really good my friend! 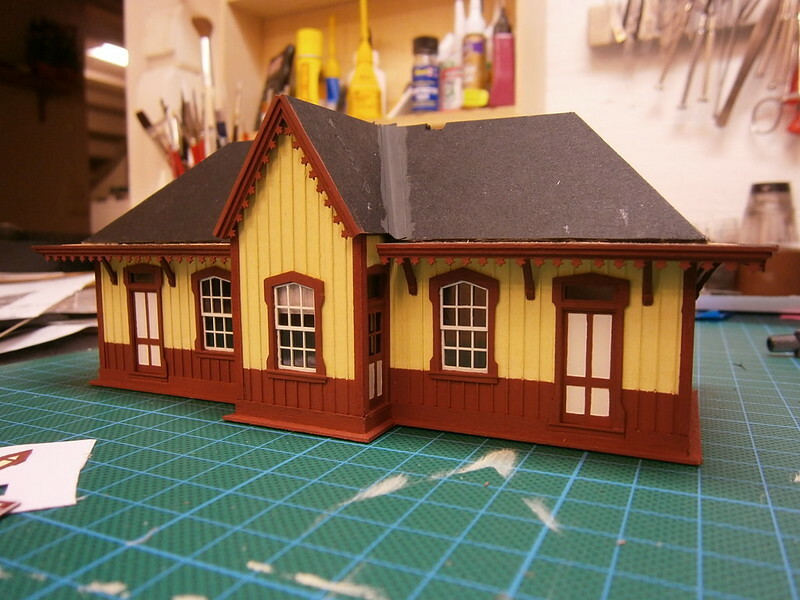 Here is some progress on the depot. The roof has been glued down and the eave brackets has been added under the overhangs. I made the attic vent by drawing the outline in Coreldraw then printing it on thick paper. I then sealed it with fixative and painted in the two colors, catwhisker yellow and oxide red. The name board is a decal also made in Coreldraw that I have applied over a thin styrene sheet painted oxide red. The window glass is clear styrene set in the swedish equivalent to Future floor finish, Johnson pledge KlarPolish the method picked up from Dave (HWCRR). It gave a somewhat old glass look which I think looks quite good. Next step is to add the shingles. 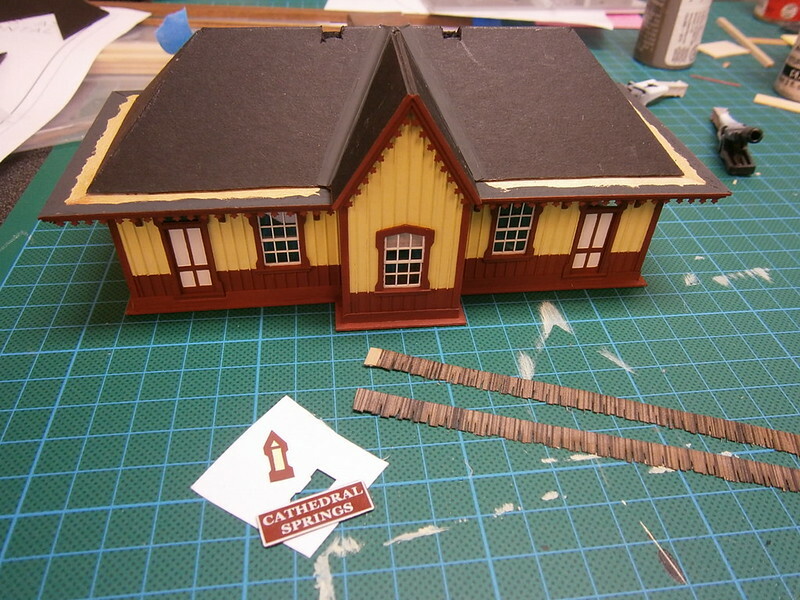 I'm using Wild west shingles in a dark tone as the roof is laid fairly recently and have not become much weathered yet. The windows look good H�kan. Do you, after the final weathering finish the structure with a coat of clear flat finish to blend everything in and "scale" the colors a bit? If you do be careful not to fog the windows too much more. 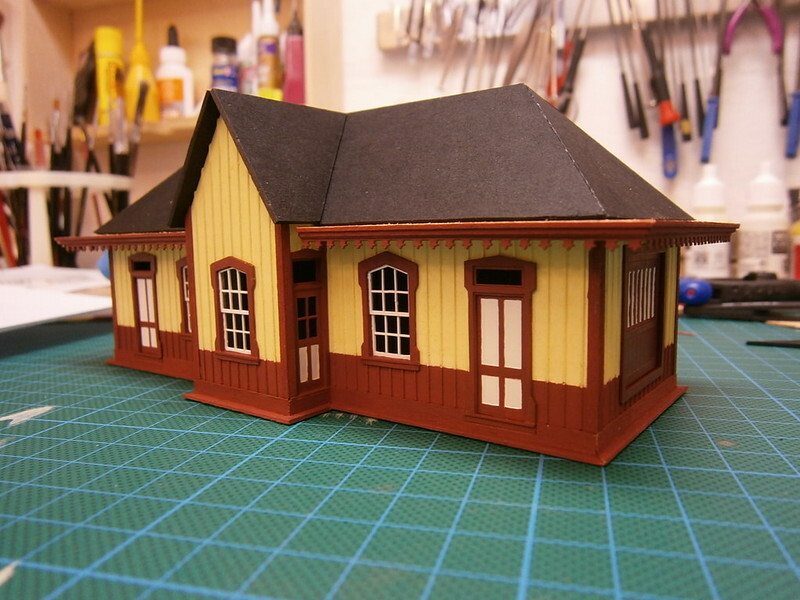 Now that you've scratch built this station will you ever build a kit again? H�kan, your depot is coming together very well! It's nice to see that beautiful decorative trim now in under the gable. And your vent & sign, will fill that space perfectly. Looking forward to seeing the roof get nailed on, get hammering. H�kan, that attic vent is going to look good when you've installed it. To be honest, I have not thought that far. I'm thinking on giving it some washes and after that dry some brushing. The colors looks harsher in the photos then they are in reality. and they can be kit-bashed into unique buildings. just giving you something to think about. Your colors do not look harsh to me, Dirt and other environmental elements lighten and blend colors. Buildings are harder to clean than vehicles and can't be sheltered so they do show the dirt quicker. IMHO in weathering, "a little dab will do ya".